Tyler Wilson is a dentist at La Clinica’s Central Point Health Center. He joined La Clinica in 2014. Dr. Wilson is a graduate of Oregon Health and Sciences University School of Dentistry in Portland and earned a bachelor’s degree in general science from Oregon State University in Corvallis. He is a member of the American Dental Association and the Oregon Dental Association. 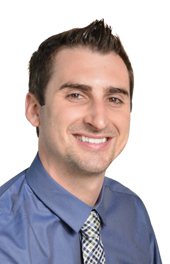 He enjoys staying current with continuing dental education and is a member of a local study club. He and his wife have two daughters, and he enjoys basketball and spending time with family and friends. Dr. Wilson grew up in southern Oregon and looked forward to returning home to help others after school. La Clinica’s approach attracted him to the organization. “I was impressed by the commitment of the dentists, staff, and organization in serving and helping people in the community I grew up in,” he said.